Are we seeing the future of inter-borough transit? 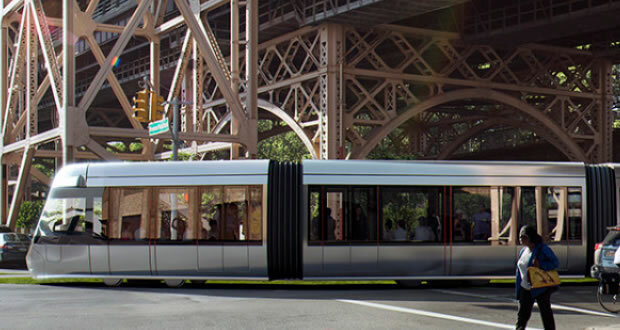 Housed in the Brooklyn Navy Yard, the Friends of the BQX, an advocacy group, has provided a mock up of what a streetcar might look like. This plan originally announced by Mayor DiBlasio, seeks to connect via streetcar Astoria with Sunset Park in Brooklyn. As we know, public transport directly between boroughs without traveling via Manhattan is greatly lacking, and this is one solution. OANA greatly supports the development of direct interboro public transit. However it is not without its issues as described in the following article in CURBED. And also, sometimes innovation can provide alternatives: Look at what is being tested in China! Developing countries were able to avoid building a land line network for telephones because of technological advancement: Cell Phones! And today the USA has the cost of an entire landline infrastructure, while these developing countries ended with superior service at a minimum of the cost. So a trolley without tracks or the cost of moving utilities is indeed intriguing. We know this has been an on going discussion for the last few years. Let us know what you think about the latest developments.